Making our guests happy makes us happy. While we can't promise perfection, we can assure you that our entire team strives to deliver their very best. Below are a few snapshots of feedback that we have received from our brides, grooms, and their families. We wanted to thank all of you for helpin gus make our wedding one of the best days. Everyone at the resort was so helpful and kind. It made the day so much easier and stress free! It was a very smooth day and I don't think anything could have made it better. The food was great and everyone had a great time! Thank you for making the wedding process a little easier! Just wanted to say THANK YOU! for all of your help throughout this whole wedding process with Custer State Park. Our wedding went off without a hitch and our guests raved about the food! Antonio did a wonderful job with the set up was very sweet! The server was great too! (I didn't catch her name though.) I didn't have much interaction with the bartender but he kept the guests happy so I'm sure he did a good job too! Thanks again for everything! Hope the rest of your wedding season goes well! "Oh my gosh! We had the most incredible day. For having our wedding at the end of September we couldn't have asked for a more perfect day. We never had a hang up the whole day at Sylvan Lake, everything went incredibly smooth. The staff were all really fun and pleasant too! They all joked around with us and made sure that our experience was a good one. I wouldn't change a thing. Thank you for doing everything you guys could to make sure we had the perfect day!" "WOW!! Where do I begin! THANK YOU SO MUCH for everything that you and your staff did to assure a truly amazing and beautiful wedding for my daughter and new son-in-law. We had such a wonderful time and your staff played a big part in the day's success. Everyone that helped with the wedding was very professional and willing to help in any way possible. Not once did I hear anyone complain or grumble about our requests or questions. They always asked if there was anything else we needed help with. My biggest thankyou and praise needs to go to Carrie—what a delightful gal who thoroughly enjoys her job! Carrie was so helpful in getting things done the day of the ceremony—doing tasks that I hadn't even thought of! She continually smiled and offered help throughout the entire evening—a genuineness that is rare! Everytime I thanked her for her help, she would say that she couldn't help but love her job—everyone is always happy during celebrations! Carrie was available and helpful the entire day and evening—even down to the midnight cleanup when my daughter and her husband realized that they had forgotten to check in and get the key to the honeymoon cabin! Carrie said not to worry—and she proceded to go get the key and bring it to them! That's what I call going above and beyond!" "I just wanted to let you know we had tons of compliments on the reception at the auditorium. Again thanks so much for all your help. It was a special day. Please let Carrie know how much fun it was working with her too. She was amazing wondering and letting us wait until the last minute to see if it was going to rain or not. Again, thanks!!" 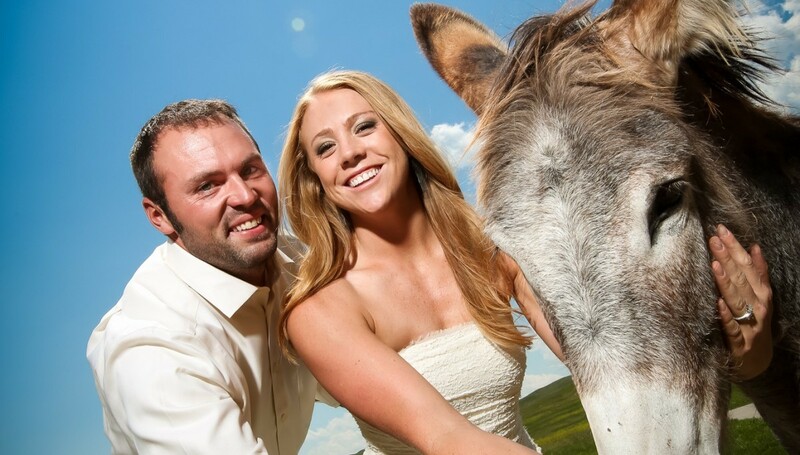 Did we host your wedding at Custer State Park? Tell us how we did.